If you find yourself in in need of a business valuation or involved in legal proceedings that involves complex financial matters, Brady Ware’s accredited and certified experts can provide the necessary analysis and support to your bankers, attorneys, or other outside counsel. You can rest assured that our experts will vigilantly protect your financial interests. The reasons you might need a business valuation are many. You might be considering a merger or acquisition. Perhaps you’re contemplating a major transaction or facing a dispute between shareholders. Or maybe you’re just looking for deeper insight into your strategic planning. Whatever the reason, you need timely and accurate valuation services, so you can take action from a position of knowledge and strength. Establishing an accurate assessment of the fair market value for any business, enterprise, or asset requires in-depth, specialized knowledge. Brady Ware offers qualified business valuation services to business owners, attorneys, financial planners, insurance companies, judges, financial institutions, real estate appraisers, and business brokers. The Accredited Business Valuation (ABV) designation, established in 1996 by the AICPA, is granted exclusively to CPAs with extensive professional experience in business valuation. The Certified Valuation Analyst (CVA) designation, established by the National Association of Certified Valuators Analysts (NACVA), is granted to CPAs qualified to provide capable and professionally execute valuation services. We have several team members who have earned their ABV or CVA accreditations. All are adept at providing business valuation services to meet the growing demand, especially from owners of family businesses, for advice on estate and gift tax issues, succession planning, divorce settlements, and issues surrounding selling a business or buying a new one. Our experts are independent, knowledgeable and objective. 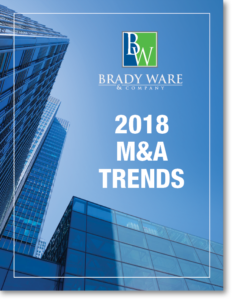 Regardless of the reason you need a business valuation, Brady Ware provides the most accurate and thorough examination possible. For years, our ABV and CVA specialists have helped hundreds of companies with valuation, from local and regional businesses to publicly traded companies. When you’re facing a legal dispute, the stakes are high. Your financial future, reputation, and business may all be on the line. And when finances are involved, the issues quickly become complicated. Litigation can drain your time and concentration. Brady Ware allows you to focus on legal considerations, confident that the financial matters of your case are in the hands of qualified professionals. Today’s legal environment often requires litigators to bring in specialized accounting support. Our professional team grasps the subtleties of financial issues in much the same way that attorneys understand the fine points of the law. We provide litigators with the special technical, investigative, analytical, and communications tools they need to apply accounting and financial methodology in legal matters. One of the ways we do this is through fraud examination. The Certified Fraud Examiner (CFE) designation is bestowed by the Association of Certified Fraud Examiners (ACFE). The CFE credential denotes proven expertise in fraud prevention, detection, and deterrence. CFEs are trained to identify the warning signs and red flags that indicate evidence of fraud and fraud risk. We are ready to dig as deeply as necessary to uncover and illuminate fraud when it occurs. We also identify the relevant financial considerations, quantify the issues, and present our conclusions in clear and effective reports, testimony, and exhibits. Furthermore, we have extensive experience as expert witnesses. We work with attorneys during all phases of litigation to uncover meaningful evidence that powerfully supports your legal position. Moreover, Brady Ware meets the highest educational and ethical standards. We undergo a strict practice-monitoring program designed to ensure the highest quality services for you, your business, and your client.